As reported on last years ‘final’ Spotters Day here, plans were already known for a ‘real’ final Spotters Day for the end of June this year, just prior to the iconic F-4 Phantom’s retirement from the Luftwaffe. As well as the Spotters Day on the Friday, for which prior registration was required, a public Open Day was planned for the Saturday, to include a flying display program. In addition to catching the resident classics one more time, excitement had also been building over the expected visitors for the show, including ‘foreign’ Phantom participation. These were just a bonus though, with the highly anticipated final displays by the legendary Spook here, being the reason why so many people had made plans to attend, as the Germans marked the event with specially painted aircraft ‘putting on a show’ with a grand finale. Another not to be missed ‘last chance’ event then! 37+01 ‘First In, Last Out’ painted in a special blue & gold ‘Phantom Pharewell’ colour scheme. The first Phantom delivered to the Luftwaffe. 37+22 Norm 90. Re-painted into the current, final scheme, as first applied during the ICE upgrade program. 38+10 Norm 72. Camouflage scheme as worn during the first two decades in service. With large serial and high-viz markings. 38+13 WTD-61 ‘Flight Test’. Painted in a special black & orange colour scheme with ‘Don’t Let Me Die, I Want To Fly’ on the fin. 38+28 ‘45 Years in Schortens’ (of maintenance at Jever) special markings, as painted in 2012. 38+33 Norm 81. Grey with wavy camouflage, as first applied during the Peace Rhine upgrade program. The others, in regular markings were: 37+92, 38+37, 38+48, 38+62 & 38+64 of JG71, and 37+15 of WTD-61 ‘Flight Test’. Of these, all were on display during the Spotters/Open Day, apart from 37+92 (QRA area) and 38+64 (inside Hangar 112). Of course, the sad reality of the disposal of the remaining Phantoms began after the weekends event, with most heading to nearby Jever for scrapping. 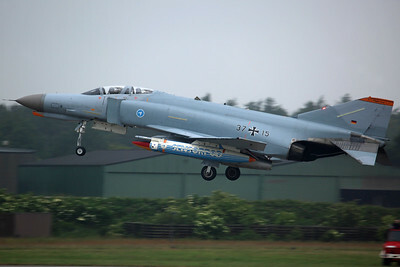 A couple will survive as gate guards though, not surprisingly including 37+01, which will remain at Wittmund on display. 38+10 will apparently guard the gate at Neuburg, while again, not surprisingly, 38+13 will be displayed at its Manching home. Those two Manching test aircraft were infact the very last German Spooks to fly, operating for a further month, until their final flights together on 24th July. The final, phinal end of an era. Flying with Gulf Air, direct from Bahrain to Frankfurt, GF017 was operated by A320-200 A9C-AN. Departing at 0120, landing 6.05 hours later at 0625L, i then had a 500km drive straight to Wittmund, after picking up the VW Golf hire car. Despite the long drive, this was the quickest way to get to the base, for the Thursday afternoon arrivals, wanting to maximise as much time there as possible over this short trip. Arriving in Frankfurt the weather had been grimey, but had much improved by half way to Wittmund, only to then end up being very wet on reaching the base. Just like last year… what is it about this place, could it actually be worse than the UK?! Driving down the very muddy track to the popular photospot on the Southside of the runway 26 landing end, the expected masses of photographers were of course in place, waiting and hoping for some action. Unfortunately, it had been official stated that there would be no JG71 Phantom flying today or tomorrow, but there was all the visitors for the show to arrive. However, it seems the weather had put pay to that, with all inbounds today being cancelled! Wash Out! OK, today everything must arrive! Any improvement in the weather though?... no! Heading back to the same photospot, where the track through the trees was becoming swamp-like, the first inbounds for the show were already on the way, with GAF A319CJ-100X 15+02 landing first. Due to the conditions, only a couple of arrivals performed overshoots before landing (the German Orion and ‘Arctic Tiger’ Tornado), with highlights including the two Flight Test F-4F’s from WTD-61 at Manching. The only other GAF unit flying the Phantom, 37+15 arrived carrying a large sensorpod under the left wing, while 38+13 is in the recently painted special black and orange checker colours, with the Spook image on the fin and ‘Don’t Let Me Die. I Want To Fly’. Nice. 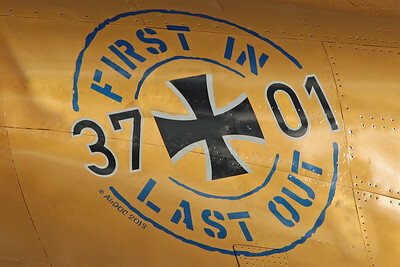 Among the remaining arrivals, two other nice special schemes were ‘Bavarian Tigers’ Eurofighter 30+29 of JG74 at Neuburg, and Belgian AF F-16AM FA-110 of 349Sq/10Wg, painted in 70th anniversary markings as ‘GE-X’ with a Spitfire image on the fin. So, after yesterdays wash out, at least this morning was busy enough with the arrivals, despite the schizer weather. The bad news though were the cancellations. Not many of those that were due didn’t make it, but it did include some of the best stuff, including the Polish AF Mig-29. Worst had to be the Greek AF Phantom, which was to be the only ‘foreign’ F-4 present, after the Turk had cancelled earlier. Bit of a bizarre story though, as although F-4E 01513 of 338Mpk (not the billed RF-4E) had made it as far as Aviano (arriving as HAF338), that would be as far as the aircraft got! Apparently giving up due to the weather at Wittmund, the pilots then flew commercially to Germany to still be part of the event! An all-weather fighter with fair-weathered pilots then! Big let down! Todays plan for the Spotters Day was entry onto the base just after mid-day, after all the arrivals had landed. As some of those present headed off for this, i had decided to give it a miss. Although being registered, the thought of walking around the static aircraft in the rain was just too much, after being stood out in the cold (although under cover) all morning. As it turned out, i’m sure most of those that did, would only have photographed them all again in the glorious sunshine the next day! Just like the event last year, after the grimey days before the Spotters Day, the Open Day this year was going to turn out very nice! So, with the final arrivals of the day being the Spanish Hornets, it was an early finish, as i headed back to the hotel. One task to do though, en route, was to photograph the Phantoms on display at the nearby Kasserne Barracks. On display outside is 38+14, which was shot last year, though 37+03 inside wasn’t. Asking at the gate though… verbotenen! Just more shots of 38+14 then… may as well on what is probably the last ever visit here. And so the big day had arrived, and although the weather first thing was still grimey, it was forcast to much improve. Parking at one of the park and ride spots in the area around Wittmund, and taking a shuttle bus onto base, the Phantoms and other aircraft around the HAS areas were walked past, as despite very few people around to ruin any shots, they were still worthy of much better weather than this! Heading straight to the crowd line, deciding on the best position for the flying was going to be a gamble, for the best action shots. Infact, staying outside the base at one of the Southside photospots was also still an option, despite word that the police would be closing these roads. This was said to be happening due to reported ‘peace protests’ being planned, with demonstrators ringing the airfield in a human chain! Of course this nonsense didn’t happen, with just some chanting and whistle blowing heard from a small group outside the main gate during the day. So, deciding on a mid-point location, directly in front of a taxiway off the runway, it was just a matter of waiting for the action to begin, as the crowds grew bigger (totalling around 100,000 in the end). The flying display was split into two parts, with ‘the other stuff’ going first from 1100-1230, followed by the Eurofighter and Phantom ‘Grand Finale’ from 1400-1530. Starting with a few old timers, including San Marino registered Yak-52 T7-GER of the Flying Legends Yak-Team Wumme, painted in USAAF markings as ‘No Crow’ (to resemble Mustang ‘Old Crow’! ), there was then a spirited display in specially marked German Army Bo-105P1 86+70. Then a bit of unplanned excitement with resident A-4N Skyhawk N432FS of the BAe Flying Systems Aerial Target Services, which on take off, kept his gear down and airbrakes open. Strange? After a few passes the arrestor hook then came down, as fire engines headed to the runway 08 landing end, with the cable being deployed. A problem with the undercarriage had resulted in the emergency landing, as the Skyhawk lurched on touchdown, thankfully taking the cable ok to end the incident. First time to witness a cable landing, unfortunately it was too far away to get any decent shots. For the photographers that had chosen the Southside photospot at that end though, they must have been ‘jumping’ to have caught this up close, unlike the few hundred at the usual 26 landing end who must have been gutted! After the break, the excitement was building as the smoke from the J79 engines was filling the air in the distance, as the Spooks started up. With the sun now finally shining, the procession of Phantoms along the near taxiway was fantastic, with canopies open and pilots waving, at almost touching distance. Leading the way, of course, was ‘First In, Last Out’ 37+01, followed by ‘Norm 72’ 38+10, the ‘45 Years’ 38+28 and ‘Norm 90’ 37+22. Unfortunately, ‘Norm 81’ 38+33 had suffered problems on starting, with the crew quickly jumped into spare 38+28 (‘last years special’!). Later realizing i still didn’t have any shots of 38+33 in the retro scheme, thankfully it was then parked on a taxiway close to the static area where it could be photographed nicely. Following the taxi-by, the Phantoms then backtracked before launching for the start of their display. With high-G pulls at the end of the runway on take off, followed by formation flypasts and airfield beat-ups, this is what we had come to see. Then with Eurofighters 30+31 and 31+00 (different special markings on each side of the fin) joining in the fun, this was the symbolic moment when the new replaced the old, with a combined formation, as the Phantoms broke away one by one. As the Eurofighters landed, three of the Phantoms had their final moment, leaving of course ‘Phantom Pharewell’ 37+01 to perform the last ever display here, piloted by JG71’s commander, Colonel Gerhard Roubal. After landing and taxying around, all the aircraft came and parked in front of the crowd, where the crews enjoyed a cermonial meeting with dignitaries, as well a personal moment together, all to the applause of the crowd. Infact, getting anywhere near this area of the crowd line to see this was just impossible, with hundreds of people crammed in trying to witness the moment. Its one of those iconic aircraft that has this affect on people! Eventually getting to the front of the crowd line to photograph these one final time, lined up together, it was then time to walk around all the static aircraft, in the great weather, as the crowds began to leave. These included the awesome GAF Tornado ECR 46+57 of AG51 in ‘Arctic Tiger’ markings, Belgian AF F-16BM FB-24 of OCU/10Wg in special ‘25 Years’ markings, Wiesbaden-based ATAC L-39ZA N214AX in a nice 3-tone brown camo (ex Romanian AF), resident A-4N Skyhawk N262WL of the BAe Flying Systems Aerial Target Services (the only one (of the six based here) which retains the ex Israeli AF camo scheme), German Navy P-3C-II 60+05 of MFG-3, GAF A319CJ-100X 15+02 of the FBS, and the preserved GAF RF-104G 24+85 of JG71 ‘R’ which is kept inside one of the old hangars, alongside a Sabre and HA-112M. Of course, the 6 other Phantoms around the HAS areas were also photographed, including ‘Norm 81’ 38+33, ‘regular’ 38+62, and the awesome WTD-61 Flight Test special 38+13, with one pilot just placing his young son into the cockpit for a picture. A future pilot maybe, but not in one of these son! So a great end to a great day, after an ‘interesting’ few days here! Heading straight off back to Frankfurt, where i had a hotel booked before flying back to Bahrain the next morning, there was plenty of time to reflect on what had just been and gone. Its true that ‘all good things must come to an end’ (the VC-10 is next! ), with the poignant final word going to ‘Phantom Pharewell’ 37+01… quoting the saluting Spook on the fin… ‘Ich Melde Mich Ab’… ‘I Sign Out’. 37+01 F-4F German AF JG71. Painted in special 'Phantom Pharewell' colours. Wittmund 29/6/13.